Maxi Line is Madix's most popular and versatile product line. Thousands of shelves, merchandising accessories, and back panel options make this line universally appealing to all market segments. Most retailers utilize this line for aisle and perimeter wall fixtures. The Maxi Line products are available in multiple sizes and finish options. Easy to assemble, Maxi Line has snap-together parts and built-in levelers. Maxi Line's standard shelves include integral tag moldings, round perforations for accessories, and slim, multi-position brackets. Tube Line is an alternative to Maxi for aisle and perimeter wall shelving. The line includes several options for shelves, merchandising accessories, and back panels. Tube Line has a reduced load capacity rating compared to Maxi Line's, but it assembles faster since it has fewer snap-together parts. The line's standard shelves include flush-front tag, diamond-shaped perforations for accessories and slim, multi-position brackets. The T-Rack Fashion and Shoe models are offshoots of Tube Line, and they are perfect for selling apparel and shoes. Madix produces displays for an array of retail applications. 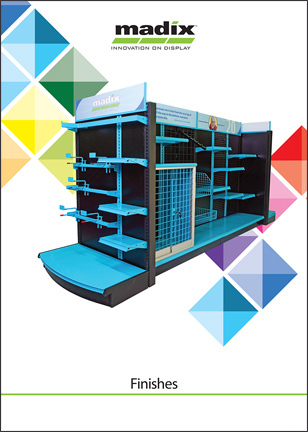 Some of the most common types of freestanding displays are four way merchandisers, platforms, display tables, rolling displayers, cubes, pedestals, and dump bins. Often these displays create focal points that complement aisle and perimeter fixture runs, or they are deployed exclusively when space is limited or a particular look is desired. Madix's all-new Luxe displays help retailers create an upscale environment, while maintaining the simplicity of installation that customers have grown to love. Maxi-mize the display capabilities of your store! Maxi Grid allows retailers to routinely change shelving configurations without wasting time or valuable merchandising space. Madix's new Vesta® Aisle and Wall Fixture draws attention to merchandise with its custom appearance and sleek design. Organize your customers, and align your sales in the process. With Madix's Queuing Fixture System, retailers create order in the store while encouraging impulse buys. Draw attention to smaller SKUs with a completely customizable system. Our fitting rooms offer flexible size configurations, accommodate ADA requirements, and allow for multiple bays. Maximize your sales-floor real estate by merchandising the bays’ outer walls, or relocate your fitting-room as needed with simple dismantling and installation—no contractor required!